DISC is a suite of scientifically validated online assessments used by thousands of organizations worldwide. When a respondent takes our online questionnaire, the process lasts about ten minutes. During the questionnaire process, respondents answer 24 questions about themselves on their personality or behavior. The questionnaire forces respondents to choose two of four options: a word or phrase that describes them once as “most” and once as “least”. For the most valid result possible, we offer respondents over 70 languages to choose from. Our DISC tool allows most individuals to take the questionnaire in their most comfortable native language (thus ensuring accurate and highly valid results). 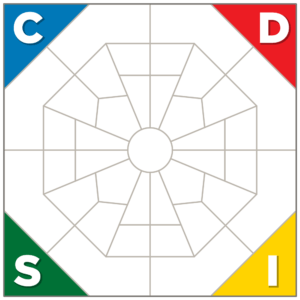 DISC assessments focus on measuring an individual’s personality and behavior. Our assessment tools measure who we really are, how we go about the day, and the behaviors that are most comfortable and natural to us. DISC reports tell respondents the DISC style(s) that comes natural to them, which in return provides them with a starting point to effectively adjust their behavior. Individuals have the ability to modify their DISC style depending on who they are interacting with and the situation that they are in. Modifying one’s natural style becomes possible with the information provided by our assessment- it just takes energy and effort. Once we identify our natural DISC style, we understand how we show up under pressure, our spontaneous reactions, and our behaviors that are visible to others. Our assessment provides information on an individual’s strengths, development areas, motivators, and de-motivators to allow for effective performance improvement. After years of research and development, we have created an assessment that takes the results of the DISC questionnaire and inserts them into algorithm to look at how an individual identifies with a DISC style. The questions themselves may seem like 24 independent questions on the surface, but there is a complex interconnected relationship between them. Our assessments are the best because of the years of research built into creating a tool that can truly measure hard-wired styles - not all DISC assessments can do that! There are other assessments out there that only measure one’s conscious, preferred behavioral styles- not who you truly are. An additional strength of our DISC tool, is that we will not generate results if we cannot clearly identify at least one behavioral style. This means that if an individual is distracted, tries to randomly select answers, over-thinks their answers, rushes through answers, or creates an inconsistent pattern of answering, then an invalid result will occur. You can be more confident that the results from our DISC tool are accurate- we identify true behavioral styles of our respondents. There are an array of options when customizing an assessment. Customization can be done to not only the look of the assessment (colors, pictures, logos, etc. ), but to the content as well (specific job roles, etc.). We offer a large library of Individual assessments, and we also offer Team, Work-Pair, Department, and Organizational assessments too! Any assessment can be tailored to a short report or a comprehensive one - we can accommodate to your needs and preferences! If you wish to learn more about Extended DISC® assessments and customization preferences, click the button below.